Granny Basketball is a fun-filled, competitive sport for women over 50, and it provides nostalgic, wholesome entertainment for spectators in the bleachers as well. Barb McPherson Trammell, the founder of Iowa's Granny Basketball League, shares information about the Granny Leagues, their background, and how charities benefit from the games. Granny Basketball started in 2005 and has grown to 30 teams with 300 players. At this time, 9 states participate in Granny Basketball including Iowa, Wisconsin, Missouri, Minnesota, Kansas, Oklahoma, Texas, Louisiana, and Virginia. According to Barb McPherson Trammell, the emergence of women's sports in the 1920s changed the image of women, in general, by showing that women could do what men could do, and that playing sports didn't detract from femininity. Back in the 20s, this was an important message. Barb also explains, "My father was once a girls' basketball coach and wrote a book about the experience. He recalled seeing his first girls' game, and how sedate it was - so different from the way the boys played it. Society's view of women at that time was that we were fragile, and that it was unseemly to be involved in sports. But as more women showed an interest in playing, everything changed." She continues, "Girls' basketball caught on in Iowa in particular because men here already knew that active women didn't mess up their reproductive systems, which was a common belief back then. In Iowa, women worked on the farms, baled hay, plus raised a family, and so men understood that women were both sturdy and feminine." Granny Basketball started as a charity fundraiser and continues the practice to this day. Each of the Granny Basketball teams choose a charity or non-profit cause and donates 100 percent of the contributions and gate receipts from the games to their chosen charities. Barb describes how she originally came up with the idea, "I had several ideas all at once, and thought about finding a way to incorporate exercising. Many women I knew used to play basketball in school and still loved the game. I decided a good way to raise money for the Old Stone School preservation efforts, get a little exercise, and get out of the house at the same time would be to play basketball." The Granny Basketball teams play in the traditional 1920s girls basketball uniforms, showing no skin and wearing bloomers. "Bloomers were once considered to be very freeing for women!" Barb revealed, "It was the closest thing to pants that they could get. The bloomer thing is also good for women our age because they cover up all kinds of sins. Plus, it goes with the 1920s look. I doubt that anyone would be interested otherwise. It's like a belly dancer doing her dance in jeans and a t-shirt." She also noted that they're out there to just have fun and she hopes the crowd can see that. It's especially fun to see the crowd watch in disbelief when an 80-year-old sinks a shot. Barb's philosophy behind her slogan, "Die with your tennies on," references cowboys and how they die with their boots on. She and her fellow players don't want to die in a rocking chair or wheelchair, they prefer to die in action. The leagues have players ranging in age from 50 to 81. There is also a player who is 71 and has Parkinson's disease. "It's done her a world a good to play the game." Barb elaborates. "No matter what frailty you have, exercise usually helps it. We use many different muscle groups and 'hustle,' even if we don't run. Everyone takes rest breaks when the ball is in play at the other end of the court, so it's safe and fun." Barb also pointed out how unique and unexpected it is for women their age to be doing this. She explains, "Most people say, 'I want to see this for myself, but I just can't picture it.' I say just form a team and get after it. It's such a great stress reliever, too. Everyone has problems, but you get on the court, you don't think about any of that. You just think about making the points, you leave your everyday life behind." Barb acknowledged that there really aren't that many fun opportunities for older women that also have a great social aspect like Granny Basketball does. For members who are recently widowed or divorced, this is an excellent outlet. By traveling together, they meet new friends and form a wonderful team camaraderie. She also noted that there are women who still love to compete but so many senior exercise activities are solitary. Granny Basketball offers genuine competitive games and is a great group activity. Is There a Grandpa Basketball League in the Future? While there are a number of senior men's basketball leagues to join, there is yet to be a grandpa basketball league. When asked about that, Barb stated, "I talked to a man in Mississippi who wanted to start a Grandpa League, and not only did he have a great response from men, a lot of women contacted him, too. So hopefully, soon." Barb's biggest wish for Granny Basketball is to have every state conducting leagues for women of the appropriate age group that are fun and easy to find. She finds that people are frustrated when they call from other states because there just isn't anything out there. She also explains that while many women aren't in the right athletic shape to compete seriously, they are able to handle a more fun-focused game like Granny Basketball. She also added, "I'd love to see a National Granny Tournament - kind of like March Madness for Grannies! And, most of all, have no one be surprised that we're out there." Barb McPherson Trammell is a retired nurse. In addition to running the Granny Basketball League and caring for her family, she works part-time in real estate. 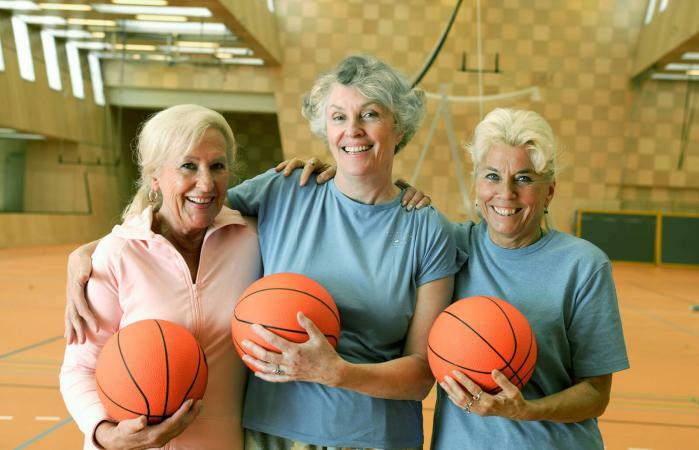 Granny Basketball is a great way to stay fit by participating on a competitive team. A few additional benefits of this type of exercise include that it contributes to longevity, enhances mobility, increases socialization, and can boost your mood and self-confidence.